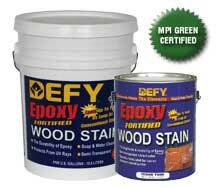 – Defy Epoxy Stain costs $35.99 per gallon. We applied the suggested two coats of stain wet on wet. Three gallons of Epoxy Stain was used for the 300-foot test deck. Translates to $.36 a square foot. – There was no mold or mildew on the deck after 2.5 years. – We found that the Defy Epoxy Stain was a little difficult to apply. Saversystems, the manufacturer of Defy products suggests applying two coats of stain “wet on wet”. We watched the free DVD that came with the stain and followed the directions. The first coat penetrated into the wood extremely well. So well that we needed to move fast so the stain would not dry. The second coat was applied 30 minutes after the first coat. This second coat was substantially easier to apply and evened out the overall appearance. We would suggest tarping the floor when staining the rails to avoid drips drying on the floor. – No darkening and just a slight fading after 2.5 years. – Defy Epoxy would be easy to re-coat since the stain penetrated into the wood with little to no darkening. Using the Defy Wood Cleaner would be enough to prep the wood. – Defy Wood Stains continue to impress. We found that the Defy brand of stains will penetrate better into the wood than any other water-based stain on the market. The Defy Epoxy easily outperforms other water-based stains such as Behr Premium and Sherwin Williams Deckscapes, putting the Defy Stains on par with many high-end oil-based stains. I have rustolium on now, which is past due and very faded, can I stain over it? Can you tell me where to find the better products, ugh. I only have home depot lowes and walmart in my area? Hello, you cannot stain over the Rustoleum with this or any other brand. Try contacting the manufacturers for help locating. Defy epoxe fortified stain was applied to my log home six months after it was built. The contractor had quite a few problems with his spray equipment gumming up during application but the finished product looked great. It is now five years old and needing refinishing. The south end has turned dark and all exposed surfaces are thinned to the point of being very transparent or flaking off. No graying of the logs has occurred. Surfaces protected by roof overhang and porch roofs look good as new. Due to the thinning of the finish over time, chemical stripping should work well for preparing to recoat the house. I do not plan to recoat with Defy however because of the short (my opinion ) lifetime of the product. You could try the Defy Extreme which is the improved version of the Epoxy. Better UV protection. Hello, I have a cedar deck. I removed each board and sanded with a belt sander. 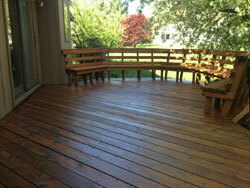 I would like to used the epoxy fortified deck stain stain, but was wondering if it works on cedar decking. I reside in central Oregon, where the climate is dry, less then 20" of rain a year, but is in the snow zone (4000 ft elevation). Thanks Gary. Gary, best to use the Defy Extreme which is an improved version of the Epoxy. The manufacturer has stated that the Epoxy will no longer be available after 2014. Yes you can use the Extreme for the Cedar wood. I started with my stain removal and I'm wondering if 100% removal means every single spot. I've been using a chemical stain remover and its leaving behind small spots and patches. Is there something else I need to do to get this off? Trudy, shoot for 95% removal or more so the new stain will work correctly. Hello. Need to apply a new coat of stain to my deck which was stained with a water based stain about 3 years ago. It was a solid stain that is mostly stripped from the deck floor at this point. I would like to use the Defy brand but I don't know which one of their stains would work. I would appreciate some advice. Trudy, the solid stain must be removed 100% before you can use the Defy Epoxy or Extreme stain. I have about 2.5 gallons of Defy Epoxy Fortified Stain left that i bought in Sept 2007. It has been in my non heated garage all those years. Any ideas on whether it would still be OK to use? Hard to say but probably okay. I live in Omaha, Nebraska and had a new Cedar fence put up in November. I plan on staining it this spring and wanted you suggestion on what stain to use. I would like to preserve the Cedar natural look, but a stain that will provide the longest amount of protection. Considering it will only be a few months after the fence was up, do I need apply any cleaning products as part of the preparation process or would a power wash alone be sufficient? Mike, If you have rough wood as most fences do then you can just do a light cleaning to remove dirt then stain. if the wood has started to gray then you would want a wood cleaner. Pigments in the stain is the key to longer life. The richer the tone the longer it takes to fade is the general rule. I would look at TWP Stains or Defy Extreme Stain. Can this product be applied to Trex decking? We live in southern New Mexico and our deck is starting to deteriorate so we need to seal it. you are not supposed to apply a second coat if the first is dry. so how do you apply second coat wet on last section where you only have one exit. Bill, apply the first coating to the entire floor then reapply another coat to the floor after about 20 minutes. We have a white cedar deck that has not been treated. It was installed last summer/fall and is a weathered grey color right now. I need to treat it with something in the next few weeks. I have had very bad experience with Cabot's water-based deck stain and wouldn't go with water-based again. All I want to do is apply a product that will protect the wood, not change the color much. I live on the ocean in Maine where the weather is challenging, to put it mildly. Part of this deck is on the water-facing side and also a Southern exposure, so it takes a beating. Donna, Defy is water based so that is out. TWP 1500 would be a good choice if you can find it locally or online. Do you have any pictures of this deck? We are building a home on the panhandle of florida and have a 400 sq ft pressure treated pine deck that I plan on staining in a couple of months. I am thinking about using the Defy Extreme in walnut. I know you tested the Defy Extreme but I think it was in the cedar color. Do you recommend both a wood cleaner and brightner prior to applying the stain? One more question. When you apply wet on wet, recommendations on what to do to prevent stepping on areas already stained when applying the second coat.Really enjoy your site as it is packed with excellent information and helped me with my choosing a stain. We have added the picture. Yes you should clean and brighten the wood. You can step in your first coat after about 20 minutes just do not step in your second coat. Are you aware that your pages will not print? I wanted to print-out the info and then confer with my husband. Soome pages will print, but never the first page. Not sure why you have the issue but they do print from our end.